Home > unemployment > Sometimes Factories Move Abroad, That's OK. Sometimes Factories Move Abroad, That's OK. 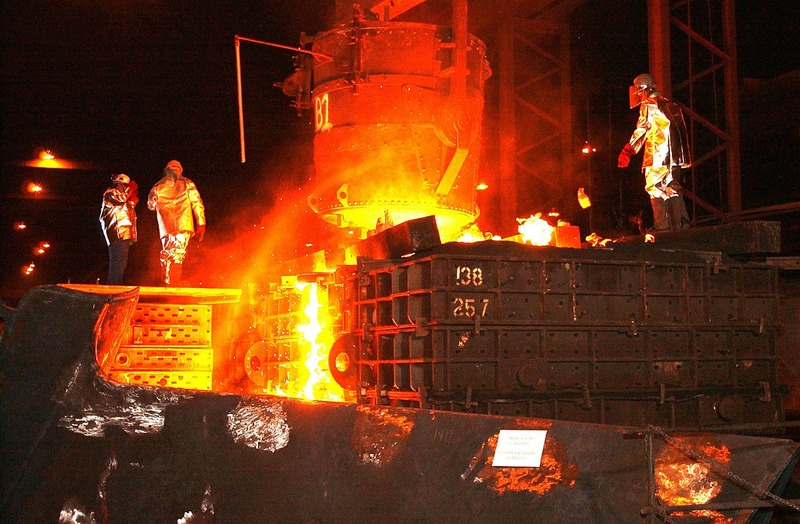 Writing in The New York Times recently, Louis Uchitelle calls for labor unions to be strengthened in order to prevent American firms from closing factories in the United States and shifting production abroad. Implicit in his argument is the notion that factories and the employment they provide are inherently desirable and the more the merrier. Before addressing this point, however, let’s first acknowledge that the decline in the number of factories and factory workers in the United States is overwhelmingly a story about automation and improved use of information technology rather than trade or outsourcing. A widely-cited study by researchers at Ball State University found that increases in productivity explain almost 88 percent of such job losses. Uchitelle’s contention, meanwhile, that greater unionization would stave off factory closures or even cause more to open in the United States is debatable. 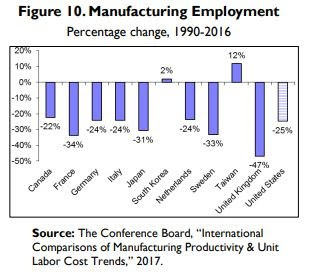 Sweden, the United Kingdom, and Japan, for example, all have significantly greater rates of unionization than the United States and yet have experienced higher percentage declines in manufacturing employment since 1990. And while he laments the “nearly neutered industrial unions" in the United States and their diminished proclivity to engage in strikes, a fondness for such worker protests hasn’t prevented France from similarly experiencing a greater percentage decline in factory jobs. But even if increased unionization held the promise of fewer factory closures, it’s still not apparent why that outcome should be desirable. In fact, a blind obsession with the preservation of factory employment would almost assuredly make us worse off. Economies are not organisms encased in amber but systems that must continuously evolve and adapt. If a company decides to relocate a factory overseas it is because its task can be accomplished cheaper or more efficiently elsewhere. Realizing such efficiencies and doing more with less is the sine qua non of economic growth that frees up additional resources. Trade and outsourcing destroy jobs, but they also create new ones. While the job losses that result from such dislocations are apparent, invariably less appreciated and less noticed is that the resulting cost savings will allow for either new investments by the firm, cost savings to consumers in the form of lower prices - both of which contribute to new job creation - or some combination thereof. Trade and outsourcing destroy jobs, but they also create new ones. One example of this dynamic is the economic relationship between the United States and China. Although China is frequently blamed for manufacturing job losses, less noticed is that trade with the country has also produced commensurate employment gains elsewhere in the economy (as well as within manufacturing - among the top export categories to China in 2016 were a combined $49 billion worth of aircraft, machinery, and vehicles). According to economist Maximiliano Dvorkin of the Federal Reserve Bank of St. Louis, competition from China resulted in the loss of 800,000 jobs between 2000-2007, primarily in the production of computer and electronic goods, primary and fabricated metal products, furniture, and textiles. However, he also found that the economy gained a similar number of jobs in other sectors, such as services, construction, and wholesale and retail trade (significantly, Dvorkin also says that as a result of savings to firms of lower production costs and access to cheaper Chinese-made goods, “U.S. consumers gained an average of $260 of extra spending per year for the rest of their lives."). Is the Reshuffling of Production Jobs Really So Bad? While we cannot know with exact precision which jobs were lost and which were gained as a direct result of this bilateral trade, it’s worth noting that Bureau of Labor Statistics data show average wages (a metric which does not include other forms of compensation such as health insurance) within the categories of “Textile, Apparel, and Furnishings Workers," “Miscellaneous Textile, Apparel, and Furnishings Workers," and “Textile, Apparel, and Furnishings Workers, All Other" - one of the areas in which the United States lost jobs to China - to range from $26,810 to $35,180. Among construction workers, meanwhile - an area the United States experienced job gains as a result of trade with China - average wages for “Construction Laborers" are $38,890, “Construction Trades Workers" are $48,620, and “Construction Equipment Operators" are higher still at $51,050. Decisions about the location of production are best left to market forces whose ongoing quest for new efficiencies help unlock a higher standard of living. This does not mean that every production job lost was replaced by a superior one, but we should also dispense with the notion that lost factory and production jobs are invariably better paying than those gained by trade and outsourcing. Worth considering is the fact that hourly wages for production and nonsupervisory employees within manufacturing - currently $21.35 - is lower than the private sector as a whole at $26.82. Furthermore, with the economy either at full employment or close to it, efforts to prevent the closure of factories means fewer workers available for new and potentially more lucrative employment elsewhere. None of this is to suggest that factory employment is undesirable or that shifting production overseas should be actively encouraged. Indeed, to the extent such jobs are being driven out by undue tax and regulatory burdens, policy changes should be implemented to ameliorate them. Rather we must avoid the government placing its thumb on the scale through policies which promote unionization or otherwise and placing a particular premium on such jobs. Decisions about the location of production are best left to market forces whose ongoing quest for new efficiencies help unlock a higher standard of living. To actively thwart this or throw policy-driven sand in the gears of economic change is to halt such progress, and ultimately to harm workers. Courtesy of Colin Grabow, Reprinted from Cato At Liberty via Econintersect.com (article archive here).